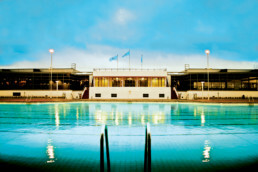 A large and uniquely 12-sided shaped lido with two fountains, a grandstand and an entrance block. Following closure in 1998 campaigns were launched immediately to return the lido to its former glory. Hillingdon Council devised and delivered a major redevelopment of the site. 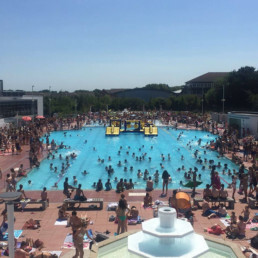 This cost £25m, was carried on in 2009/10 and resulted in a range of new indoor leisure facilities as well as the refurbishment and re-opening of the listed lido. The entire site is managed on behalf of the Council by Fusion Lifestyle. 50m unheated outdoor pool, heated outdoor children’s pool, lots of sunbathing space, pool side catering. The outdoor pools are open seasonally. Alongside the listed lido sit a range of modern leisure facilities including an indoor 50m pool, gym & fitness, running track, 5-a-side football and indoor sports hall. Uxbridge Lido was opened on 31st August 1935 with a fanfare of trumpets from the band of the Royal Air Force. Also at the opening ceremony there was an Exhibition of Modern Speed Swimming, a Display of Spingboard Diving and an Exhibition of Figure Floating. To continue to offer a very wide variety of leisure, health & fitness activities on one site including the historic pool and a wide range of modern facilities.